In aerodynamics, the lift-to-drag ratio, or L/D ratio, is the amount of lift generated by a wing or vehicle, divided by the aerodynamic drag it creates by moving through the air. A higher or more favorable L/D ratio is typically one of the major goals in aircraft design; since a particular aircraft's required lift is set by its weight, delivering that lift with lower drag leads directly to better fuel economy in aircraft, climb performance, and glide ratio. Lift-to-drag ratios can be determined by flight test, by calculation or by testing in a wind tunnel. Lift-induced drag is a component of total drag that arises whenever a finite span wing generates lift. At low speeds an aircraft has to generate lift with a higher angle of attack, thereby leading to greater induced drag. This term dominates the low-speed side of the lift versus velocity graph. Drag polar for light aircraft. The tangent gives the maximum L/D point. Form drag is caused by movement of the aircraft through the air. This type of drag, also known as air resistance or profile drag varies with the square of speed (see drag equation). For this reason profile drag is more pronounced at higher speeds, forming the right side of the lift/velocity graph's U shape. Profile drag is lowered primarily by streamlining and reducing cross section. 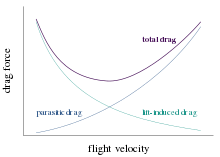 Lift, like drag, increases as the square of the velocity and the ratio of lift to drag is often plotted in terms of the lift and drag coefficients CL and CD. Such graphs are referred to as drag polars. Speed increases from left to right. The lift/drag ratio is given by the slope from the origin to some point on this curve and so the peak L/D ratio does not occur at the point of least drag, the leftmost point. Instead it occurs at a slightly higher speed. Designers will typically select a wing design which produces an L/D peak at the chosen cruising speed for a powered fixed-wing aircraft, thereby maximizing economy. Like all things in aeronautical engineering, the lift-to-drag ratio is not the only consideration for wing design. Performance at high angle of attack and a gentle stall are also important. As the aircraft fuselage and control surfaces will also add drag and possibly some lift, it is fair to consider the L/D of the aircraft as a whole. As it turns out, the glide ratio, which is the ratio of an (unpowered) aircraft's forward motion to its descent, is (when flown at constant speed) numerically equal to the aircraft's L/D. This is especially of interest in the design and operation of high performance sailplanes, which can have glide ratios approaching 60 to 1 (60 units of distance forward for each unit of descent) in the best cases, but with 30:1 being considered good performance for general recreational use. Achieving a glider's best L/D in practice requires precise control of airspeed and smooth and restrained operation of the controls to reduce drag from deflected control surfaces. In zero wind conditions, L/D will equal distance traveled divided by altitude lost. Achieving the maximum distance for altitude lost in wind conditions requires further modification of the best airspeed, as does alternating cruising and thermaling. To achieve high speed across country, glider pilots anticipating strong thermals often load their gliders (sailplanes) with water ballast: the increased wing loading means optimum glide ratio at higher airspeed, but at the cost of climbing more slowly in thermals. As noted below, the maximum L/D is not dependent on weight or wing loading, but with higher wing loading the maximum L/D occurs at a faster airspeed. Also, the faster airspeed means the aircraft will fly at higher Reynolds number and this will usually bring about a lower zero-lift drag coefficient. is known as the wetted aspect ratio. The equation demonstrates the importance of wetted aspect ratio in achieving an aerodynamically efficient design. At very high speeds, lift to drag ratios tend to be lower. Concorde had a lift/drag ratio of around 7 at Mach 2, whereas a 747 is around 17 at about mach 0.85.
where M is the Mach number. Windtunnel tests have shown this to be roughly accurate. A House sparrow has a 4:1 L/D ratio, a Herring gull a 10:1 one, a Common tern 12:1 and an Albatross 20:1, to be compared to 8.3:1 for the Wright Flyer to 17.7:1 for a Boeing 747 in cruise. A cruising Airbus A380 reaches 20:1. The Concorde at takeoff and landing had a 4:1 L/D ratio, increasing to 12:1 at Mach 0.95 and 7.5:1 at Mach 2. A Helicopter at 100 kn (190 km/h) has a 4.5:1 L/D ratio. A Cessna 172 glides at a 10.9:1 ratio. A cruising Lockheed U-2 has a 25.6 L/D ratio. The Rutan Voyager had a 27:1 ratio and the Virgin Atlantic GlobalFlyer 37:1. In gliding flight, the L/D ratios are equal to the glide ratio (when flown at constant speed). ^ Raymer, Daniel (2012). Aircraft Design: A Conceptual Approach (5th ed.). New York: AIAA. ^ Antonio Filippone. "Lift-to-Drag Ratios". Advanced topics in aerodynamics. Archived from the original on March 28, 2008. ^ Cumpsty, Nicholas (2003). Jet Propulsion. Cambridge University Press. p. 4. ^ "U2 Developments transcript". Central Intelligence Agency. 1960. Lay summary – transcript. ^ David Noland (February 2005). "The Ultimate Solo". Popular Mechanics.